Note: All are P4 only except for the Peak pony trucks which are also available in EM. These are not kits as such more an aid to produce a fully sprung diesel locomotive. 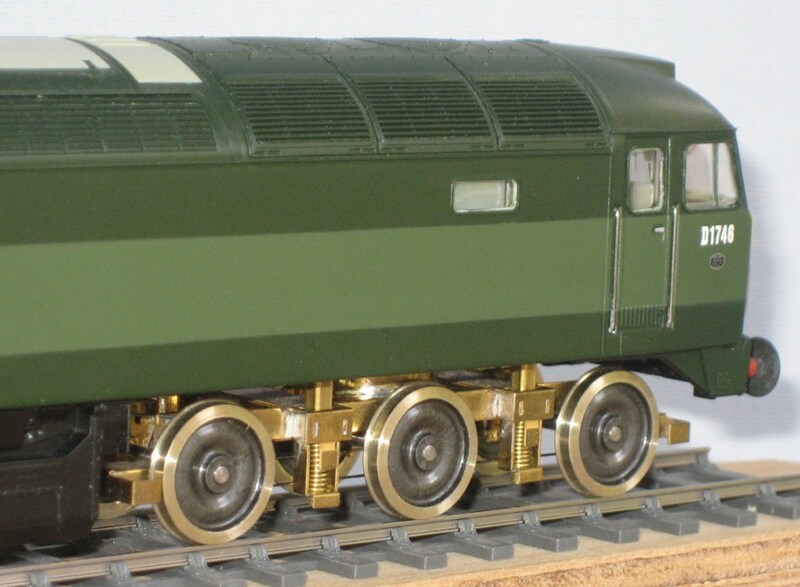 They are etched in 0.4mm brass (except the Peak pony truck which is etched in 0.25mm brass) and consist of a fold up frame with fulcrum points for guitar wire primary suspension, guides to enable secondary suspension using DIY coil springs to be produced and bolster plates to provide location to the body. They are not limited to a particular manufacturer’s model (unlss stated) but require a drivetrain with the final drive gears on the centre of the axle and a width of no more than 11.5mm. Bachmann class 47 and kit D.05. All include sufficient etches for a pair of bogies to convert one locomotive. Special ‘skinny’ High Level bearings, primary suspension carriers, horncheeks and spring wire are also included. The Peak pony trucks are available seperately for those wishing to replace the Bachmann examples in a ‘drop in’ P4 conversion. A number of other items, depending on type, will be required but these are readily available from the likes of Eileen’s Emporium. These don’t exactly follow the prototype as it is designed to use the same coil spring secondary suspension as the other types of bogie (the real thing didn’t actually have any). Designed around the Bachmann model but using the correct bogie pivot point and retaining the pony truck pivot point. Sprung self weighted pony trucks are included. Bachmann Peak and kit D.02. Bachmann Peak, kit D.02 and Shawplan lifting brackets. A pair of fold up sprung self weighted pony trucks to fit the Bachmann model. Side control springing is included if required. Bearings and springing wire is included. As per the P4 version but slimmed down for EM. The following kit follows a slightly different arrangement than previous bogies. It features guitar wire suspension throughout and is designed to fit the Hornby all wheel drive model with minimum alteration to the chassis block; everything is contained within the bogie. Features custom High Level hornblocks. Instructions can be found by clicking on the product code and title in the above listings.